I’ve always had an entrepreneurial spirit. Growing up in Mexico, I took our family’s annual trip to the U.S. as an opportunity to invest in a suitcase full of American candy. I would then resell the American treats to friends back home. It was a time when the quality and design of products manufactured in Mexico was poor, and my classmates were hungry for anything made in the U.S.A. I made a fortune, and the experience opened my eyes, at an early age, to the draw of quality goods. I didn’t know it then, but that may have been my first step toward building a luxury brand. My candy selling endeavors were followed by another significant early adventure in business. When I was 15, my father lent me some money to open a small taco shop. It was very hard to run a business when I was so young, and I left after one year, but it taught me important lessons. My father wanted me to understand the importance of hard work, of continually seeking to better myself, and the value of honesty and family. Those values served me well when in 1997—without knowing anything about the industry—I launched my first spirits product, La Pinta, a pomegranate-tequila punch. I had done the research to know that nobody else was making the product, which was based on a local punch, La Ponche Granada, but I learned quickly that it wasn’t enough to have a delicious, high-quality product—I needed marketing power and business acumen to make it a successful endeavor. It was humbling to recognize all that I didn’t know, but it was also the first of many opportunities to be open to learn and transform to move forward—keystones of my journey as an Evergreen leader. In the wake of that experience, I pursued a master’s degree in marketing and trained to become a Master Distiller. That learning journey led to my developing Tequila Clase Azul Reposado, ultra-premium tequila, the first of what has evolved to become our line of 10 tequila products. In 2002, my ex-brother-in-law, Juan Sanchez, who had earned his MBA in the U.S., partnered with me, bringing a deep understanding of U.S. culture and opening our U.S. importing company, which was a milestone. The years that followed were a period of expansion and challenge, as we learned to navigate the spirits industry, seeking our niche. We made a lot of mistakes in those early years, as we tried to fit ourselves into an industry dominated by huge, multinational corporations, but each challenge ultimately led us to a better product and helped me develop as a leader. First, our original bottle design proved problematic, as the top of the bottle was flat, which made it hard to pour the tequila without making a mess. We redesigned the bottle and created a smaller opening at the top and a tighter lid, which kept the tequila super fresh and made it easier to pour. Not only did the new design please our clients, but this evolution is what led to our magical caps, which make a ringing bell sound when you tap them in just the right way. We like to say the sound signifies the unleashing of the magic of what’s inside. Second, my naivete about the spirits industry, as well as the business climate in the U.S., combined with my underdeveloped English created a steep, strenuous learning curve. As I worked to fine-tune my English and to understand the industry, I spent a lot of time trying to find help and guidance from outside sources, which was really difficult in such a competitive industry. Finally, I was struggling to identify our purpose as a brand. Why did we matter? What would happen if we disappeared? Would our absence have any kind of impact? In 2005, we were forced into a period of transformation that, while difficult, ultimately allowed us to answer those questions and define the brand we are today. When a hurricane destroyed Cancun, eliminating the market for what was then 40 percent of our product, the need to replace those accounts led us to Los Cabos. Entering that market, we came to truly understand luxury and the potential for our product in that space. To make our place among the big players in that landscape of high-end resorts, we were forced to explain our unique offering and had the opportunity to share the values of Mexican culture through our product. After stumbling in an industry that seemed to overwhelm us, we did something right: we fell in love with our culture, and we reflected our authentic passion for our roots in our product and artisan packaging, recognizing the potential for our disruptive, unique offering in the industry. This experience answered the big question: We learned why we matter. As we developed our brand identity and found our place in the luxury market, I embarked on a parallel journey of self-discovery that allowed me to grow as an individual and an Evergreen leader. A spiritual trip to Tulum sparked a new awareness that I had been leading my personal life in a way that I began to recognize was unhealthy and superficial. I had not been making the smartest choices in my personal or my business life because I wasn’t tuned into cause and effect in either sphere. I started to become really aware that my leadership of the company was deeply connected to our ability to deliver on strategy and move forward, and my ability to lead was being impeded by tendencies to embrace the superficial and material. If I wanted to be an example to my team, I had to lead by example and align myself with the vision of the company. Suddenly every choice I made in my personal life was significant, and I started listening to my heart and soul as opposed to my gratuitous desires. I realized that by adjusting some of my less-positive habits or routines, I would open up a more positive and productive space to do things that would benefit my clients, my employees, and my loved ones. My spiritual journey ignited my understanding of leading with Purpose. I now recognize that any success a business experiences is due to the people who embody the Purpose and vision of that company. As I have grown and evolved personally, I’ve learned to understand, respect, and empower myself enough so that now, as a leader, I can offer that same respect and opportunity to others, creating a profound level of happiness for our team and success for our brand. As we look ahead to the new, expansive opportunities our company is pursuing today, I am again entering into a period of learning, ready to embrace further growth. With plans underway to expand our brand into the luxury hospitality space through Clase Azul tasting rooms and a boutique resort now in development, I am returning to school to study toward a master’s degree in European Luxury Management. I’m ready to embrace the new experiences ahead and to help lead our company into another new chapter. I know that there will, again, be challenges in entering into a new industry, but my path has shown me that where there is challenge, there is opportunity for meaningful personal and professional development. 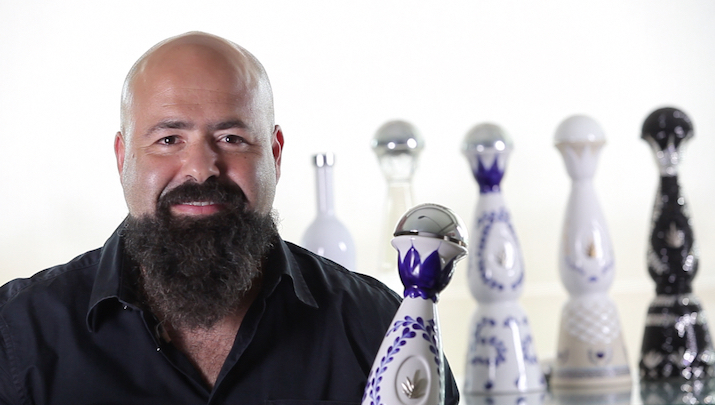 Arturo Lomeli is Founder & CEO of Clase Azul.